Yesterday we went to the Waterpark in the Grand Canyon Chiang Mai. I can honestly say that it was one of the most fun places I’ve visited in a long time! Don’t bring food and drink – you can’t take it into the Waterpark. There are plenty of places to buy provisions there, though. Be very careful with small kids in life jackets. They insist you wear them at all times in the water. My personal opinion is that they’re more dangerous than not wearing them if you’re going to be watching your child the whole time. Small children can fall face forward into the water and not know how to right themselves. Stay close to your child at all times even if they seem fine. There are 2 areas you can go into within the Grand Canyon Chiang Mai. The one on the right isn’t built up as much and seems to be mostly for swimming/viewing the canyon. We’d read that it didn’t have a great safety record. It also didn’t seem nearly as fun as the Waterpark, so we opted for that instead. They Grand Canyon Chiang Mai is basically a huge canyon filled with water. In the Grand Canyon WaterPark they’ve built shops, changing rooms, lockers and restaurants along the side. All the design is ‘American style’ from the giant Grand Canyon sign, to the old west restaurant fronts. It feels like being in a mini waterpark version of Disneyland. The main draw is the enormous inflatable assault course. There are floats, ‘icebergs’ that you can climb, slopes to clamber up, sections with holes in that you have to scoot round the side of. My personal favourite were the giant pillows with pillars attached. You could climb the pillar and jump onto the pillow. Then you wriggle over to the end before another person jumps onto it, flinging you into the air in the process. We didn’t manage that one with kids, but will definitely be coming back without them to try it out! In addition to the main Waterpark, there are 2 huge kids pools. They’re also inflatable. There’s something very cool about being in a huge inflatable pool. Each pool is filled with slides, balls, rings, and giant animal rafts. They even had a 10 foot long inflatable tunnel. You could jump into the end of it (so you’re inside the tunnel) then you can go round the middle and spin it across the surface of the water, like a giant hamster wheel. Add to that the 6 foot tall inflatable rubber duck and Jack was in absolute heaven. My goodness was the whole thing tiring! We managed to take Jack (2 years 8 months) on the main Waterpark. Possibly a rather foolish thing to do, but nothing bad happened! I would imagine that if this park was in the UK or North America, they’d almost certainly have a minimum age limit that would prevent Jack from going it. It was a little old for him, but I obviously stayed next to him the whole time. The staff were clearly watching out for him too. 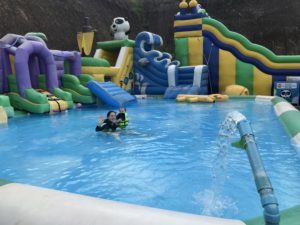 The one exception to this was the staff member who trained a giant jet of water on us the instant Jack had got onto an inflatable. Not the most helpful thing in the world! No one fell off, though, thankfully. I think this was probably just a judgement error on his part, though. We didn’t get sprayed again – they saved the jet for the group of 20/30 year old lads doing an race around the floats. Hehehe. Once Jack’d crawled around the rafts a bit he decided he wanted to touch all the inflatable animals in the water. Having done a good job of not falling off the rafts into the water, I then had to deliberately jump in so that I could swim him over to the inflatable duck. The issue, then is getting back up. These rafts are probably a foot or so thick. They do have some handles to get back on, but not very many. There are staff members to help you up, but I think you’re supposed to get up yourself. I found myself shoving Jack up onto a raft, while trying not to go under myself, and then having to quickly clamber up after him. 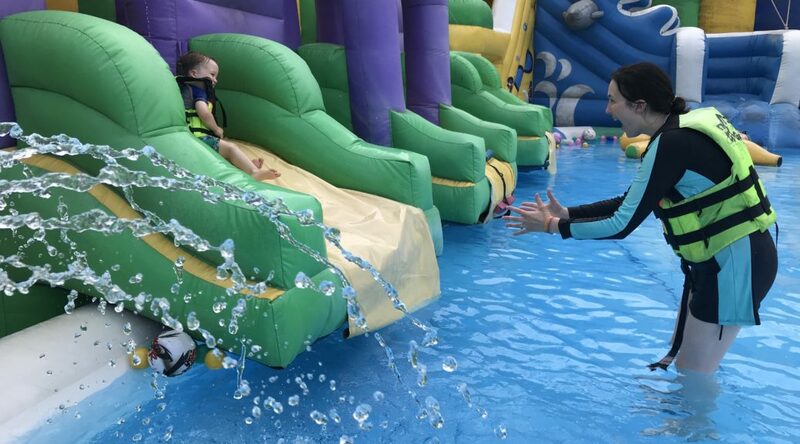 After a few iterations of this I was completely exhausted, but of course Jack was having a whale of a time and wanted to go touch the inflatable croc next! I took him back to Karl to take over, who seemed rather surprised that I seemed so tired. After half an hour or so I met them coming back out of the Waterpark. Guess who was complaining of sheer exhaustion now! Karl basically just told me the exact same story that I just told you – it seems Jack was intent on pushing both his parents as far as they would go! 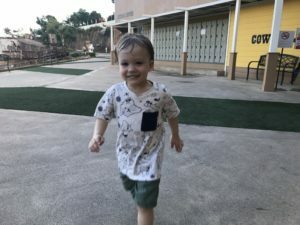 Jack – still going strong after a long day for the parents! You can’t take food or water into the water park – they make you buy it in there. They did let me take in the food that I’d obvious brought for the kids, though (yoghurt and drinks in sippy cups). The restaurants were all reasonably priced, had lots of choice and were very easygoing. So we didn’t mind buying food there once we got in. They also have lots of dried fruit bags for snacks. People walk around everywhere in their swimsuits, too. You can hop out of the water, go have something to eat and then go straight back in! The locker keys have little bags attached, so you could take a card with you if you didn’t want to go back to the locker to get cash out. There were lots of showers and changing rooms, all of which were clean and spacious. My one gripe was that they didn’t have changing tables or anywhere to put your kids. I think every pool changing room should have a playpen for babies. How much easier would that make a pool trip! They also had a free buggy that would take you all the way from the park to your car if you wanted! We were a little dubious about it at first. It seemed to appear out of nowhere as soon as we’d parked, but there was a huge sign on the front saying ‘free’ and the driver seemed smiley, patient and happy. What a good way to start your trip! We went towards the end of October, on a Sunday. The weather was around 32 degress at it’s highest. There’s no shade in the main waterpark, but plenty in the restaraunts and on loungers around the park. I also found some spots of shade within the kids’ pool to sit with Cade, my baby. It was surprisingly empty considering that it was a Sunday. We had no trouble getting one of the buggies to take us around and there were only ever one or two people in the changing rooms. In the main Waterpark there were enough people to make it enjoyable, but we had no trouble going round the floats. Staff were always there to help when needed and we never got knocked by people trying to get by us. 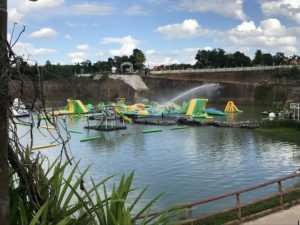 The Grand Canyon Chiang Mai Waterpark costs 350 baht per adult (£8/$10.50USD). Children under 90cm go free, children between 90cm-120cm cost 300 baht. They did let Jack in for free, even though he was clearly just over 90cm. 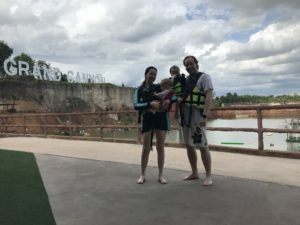 Thailand tends to be quite easygoing and pleasant when it comes to kids – we definitely appreciated it. In addition to the entry costs you can pay 50 baht to hire a locker + 100 baht returnable deposit. You can also hire a waterproof camera for 500 baht. Then the Grand Canyon zipline is an extra 200 baht. 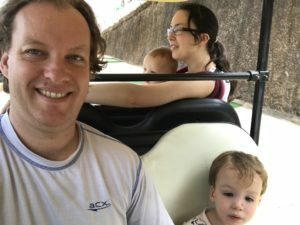 Back to Thailand – this time with kids!